Joel's Jottings: Don't cry for me, Argentina! This was the song I heard Sharon Prabhakar sing, on TV, about 15 years ago. The then-famous Indian Pop Singer and the celebrity wife of Alyque Padamsee - who was, and perhaps still is, India's leading Advertising Guru - made this song popular in its special opera-tic rendition. I had found out that this song was from the Broadway musical EVITA . 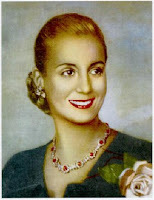 And curiosity led me to find out more about Eva Peron (Evita), the former First Lady of Argentina, on whose life it was based. (More recently, Evita was made into a movie too, with Madonna playing Eva Peron, and singing the same song). But during those days, you can say, - when I was still a student at the University - I had become an amateur-expert in Argentinian politics!! Much to the surprise, and much to the irritation of my disbelieving friends. 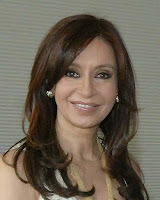 Anyway, last week, when I read that the current First Lady Christina has been elected to become the next President, I couldn't help getting excited about my past mental association with Argentina. And also, we know that Hillary would perhaps be another former First Lady who could be the President.